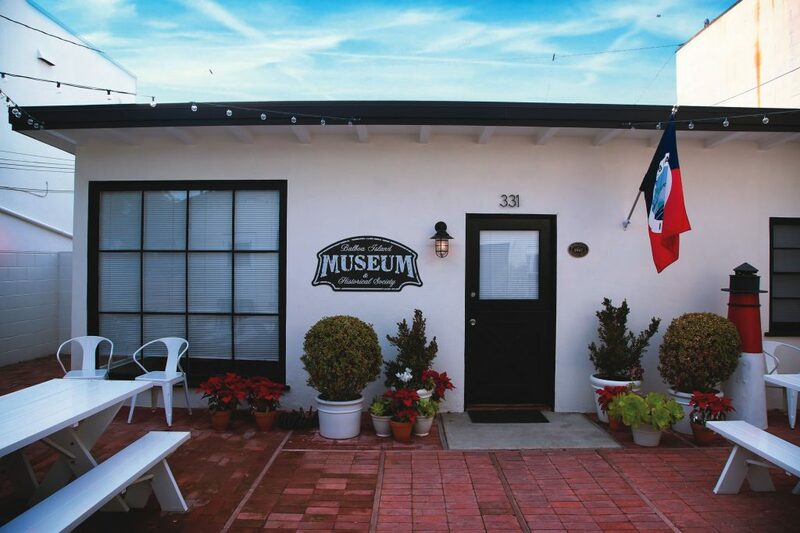 Balboa Island Museum & Historical Society helps visitors discover the community’s past. Sitting in the cool blue waters of Newport Harbor is Balboa Island—a tiny, man-made island dripping with the kind of small-town charm typically found in black-and-white TV shows from the 1950s. 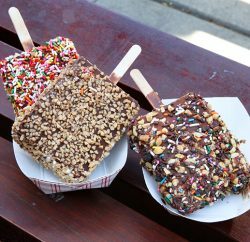 The main street on the island, Marine Avenue, is host to a number of diverse restaurants, small family-run boutiques and ice cream stands stocked with frozen bananas and Balboa Bars. The area’s rich history is filled with tales of immigrants, movie stars and ferryboats, and the Balboa Island Museum & Historical Society staff hunts far and wide to capture the essence of this small community for generations to come. Although the museum first opened in 2000, it relocated to its current home on Marine Avenue about two years ago. Before the move, Shirley Pepys took over as creative director and was faced with the task of creating new exhibits for the museum’s expanded space. To do this, she needed to research the island’s background and gather images and memorabilia to make that history come alive for visitors—in a sense, visually telling the stories of the community, something she says is her favorite part of working at the museum. 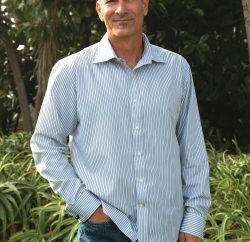 Through displays and a series of guest speakers, Pepys is able to share the art, artifacts and anecdotes of the island’s storied past. Housed in a vintage cottage rented by the historical society, many treasures await those who wander through the museum: photos of the Collins Castle, built by William Steppe Collins, the founder of Balboa Island; a timeline of the local Hershey family’s businesses and community influence; posters of films shot on the island; original place settings from Amelia’s Restaurant in the cottage’s original kitchen; and detailed histories of the Christmas Boat Parade and the ferry business run by the family of Joseph Allan Beek, who helped establish the ferry as a major means of transport in 1919. As the museum’s exhibit illustrate, Los Angeles’ elite flocked to Balboa from Pasadena in the early 1900s, snatching up property for vacation homes and later moving there permanently. The second generation of the island’s residents—the children who grew up there—are in their 80s and 90s, so museum workers hope to hear their stories before all of the original inhabitants are gone. “If people spread the word, that’s one of the ways we will be able to learn more,” Shirley says. Visits from people who grew up on the island, but have since moved away, also help teach the museum staff about Balboa’s history. When they return to their old stomping grounds, they often stop by the museum to reminisce and, in turn, end up sharing their own memories and experiences. “It’s really fun for people to come in and say, ‘I remember that,’ ” museum member Ellen Goodman explains. As the museum’s prominence in the community has grown, its speaker series has proven to be successful, filling the building’s front courtyard to capacity. The series allows local residents and visitors alike to take a trip through Balboa Island’s history with those who know it best, including the children of Joseph Beek, local authors Kate Houlihan and Jeff Delaney, and those familiar with the history of the 1927 firehouse. Last September, the museum also hosted a private memorial for Balboa native Ruth Hershey Finley—who lived 84 of her 87 years on Balboa’s Onyx Avenue—allowing her family to celebrate her life near the museum’s Hershey exhibit. 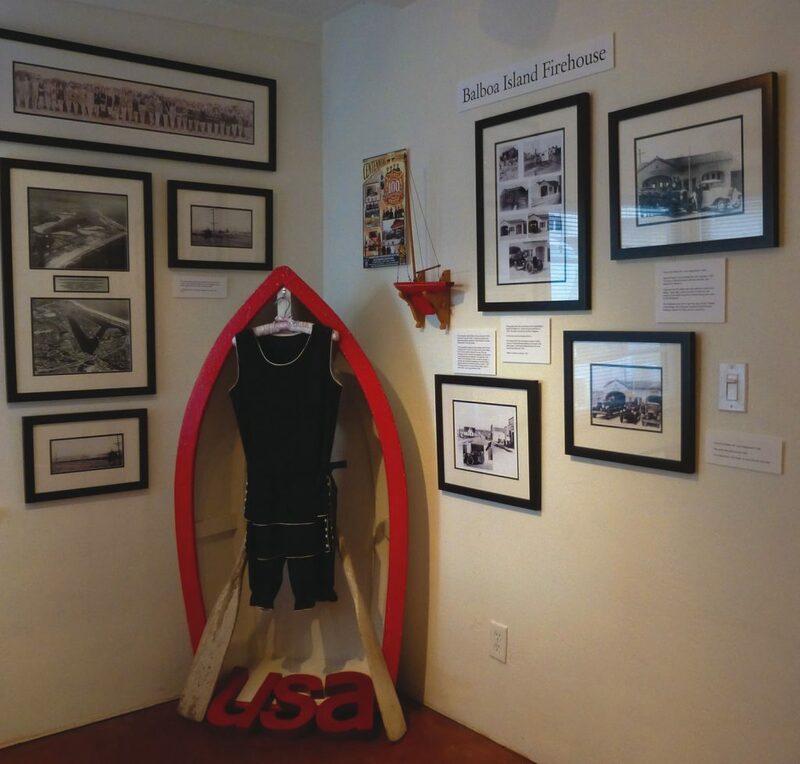 The Americana Room displays items related to the Balboa Island Firehouse.